I spent almost three years as a drug/alcohol counselor and while I like to say I helped people overcome struggles, little did they know how much they were helping me. I learned valuable skills throughout the duration of my employment and it was one of the hardest, most rewarding positions I have ever had. I never imagined that the position would help ME- and be able to apply some of the exact same strategies I was teaching and encouraging to my own life. When you are challenging others to change their life, it's hard not to reflect about your own. Although we did not technically teach or hold 12 step meetings- we vehemently encouraged all clients to participate in 12 step meetings and discussed the several benefits of working the 12 steps. The following are sayings that are typically heard in 12 step meetings that benefited me in my personal life. One day at a time- This is probably my most favorite sayings of all time. This is my life motto. While it's great to plan ahead (and you are talking to THE planner, here) you can only do and worry about so much. We can't get stuck in the past or let our worries about tomorrow get in the way of, today. A man who attended a 12 step meeting was asked how he has maintained his 20 plus years of sobriety- his answer? One day at a time. Turn it over- Sometimes our biggest frustrations come from sources that are simply, out of our control. I have been able to remember this saying during such times. I have been able to find a way of letting go of things I ultimately can't control and turn it over, having faith that in the end, life has a funny way of working things out. Keep it simple- Sometimes, I'm the first one to do the exact opposite of keeping it simple. I over think, over analyze and generally tend to make things a lot harder than they should be. This saying has helped me stay grounded and remind myself to KISS or KEEP IT SIMPLE, STUPID! Take what you need, leave the rest- This has been a KEY saying as I have dove into the world of parenting. As a parent, we are BOMBARDED with well meaning (and sometimes not) words of advice, feedback and other information. This saying has been imperative to MY own mental health and not get caught in the tangled web of information coming at me from all different sources. I have learned to take what I need and leave the rest. And feel ok with that. This saying has also benefited me in other areas of my life where maybe feedback I received or an experience wasn't exactly what I thought it would be. Even though I am no longer in that position, I still find myself using these sayings everyday. 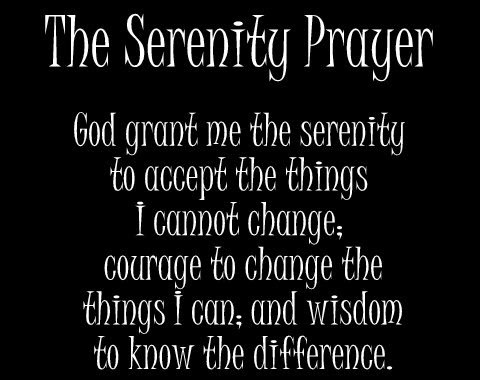 The Serenity prayer also reminds me to choose my battles and let things go that I can't control or change, but also pull on my big girl pants and make necessary changes if possible.